What stimulus features determine the psychophysical power law exponent? 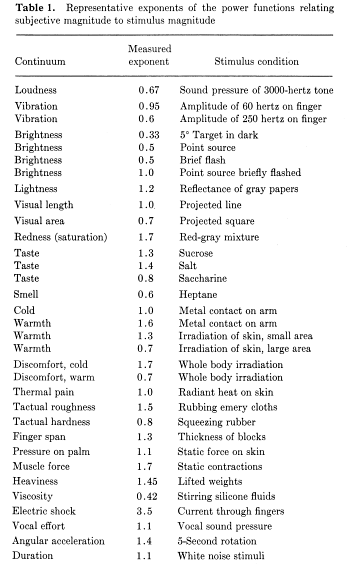 However, it is not obvious from perusing this table what kinds of stimuli tend to be associated with what kinds of power exponents -- in particular, what kinds of stimuli tend to be associated with positively accelerated psychophysical functions of intensity vs. negatively accelerated psychophysical functions of intensity. Indeed, the exponents in the table above appear to be distributed rather haphazardly to me, and I have not seen any mention of work suggesting it is otherwise in my admittedly limited literature search. So my question is: Is anyone aware of research that attempts to characterize what kinds of stimuli tend to be associated with what kinds of psychophysical functions of stimulus intensity? If so, what is the basic summary from this research, and what are some suggested readings? As hinted above, I am particularly interested in stimulus features that predict positively vs. negatively accelerated psychophysical functions of stimulus intensity, but references to and descriptions of more specific research questions are also quite welcome. Update: I thought it might help to say just a little bit more about exactly what I'm interested in finding out here, in as clear and concise a way as I know how. What I am looking for are any references to review papers and/or research articles that are about (or even that just mention) predicting the form of the psychophysical power law across a range of different stimuli, using stimulus-level predictors. It is hard to extract any general conclusions about this from Stevens's table above, given that the power law exponent appears to vary widely, sometimes being >1 and sometimes <1, even for stimuli on the same psychological continuum, as in the cases of "Taste" and "Warmth." The point of the table (and indeed the body of research that it is based on) is just to show that these functions follow power laws of some kind or other -- while this is mildly interesting, what I really want to know is how well we can predict what kinds of power laws different stimuli will follow. Please let me know if I can offer any additional clarification. Mainly: the choice of variables. Beware that the exponent depends on the choice of parameters; or even worse - relations can change from power-law to linear, logarithmic or exponential, with redefining variables. E.g. you can measure sound volume in either amplitude, energy density (square of the amplitude) or dB (logarithm of the first one). None of it is privileged. Moreover, "psychological magnitude" needs exact definition, for the same reason (so not only to specify which type of reaction is that but what is the exact physical quantity being measured). In general, if you consider only qualitative parameters, then you can look at only at qualitative behaviour of the relation (e.g. if it is monotonous). To calculate exponents (or even - to claim that a certain relation is a power function) it is not enough. Of course, there are many adaptations to make sensitivity higher (e.g. edge detection) or lower (e.g. to see well in lighting conditions differing by order of magnitude, in terms of light intensity). But to compare their exponents, for the comparison to make sense, you need to have a very good justification for the right choice of variables. Those responding make some very good points about being specific about operational definitions and such. 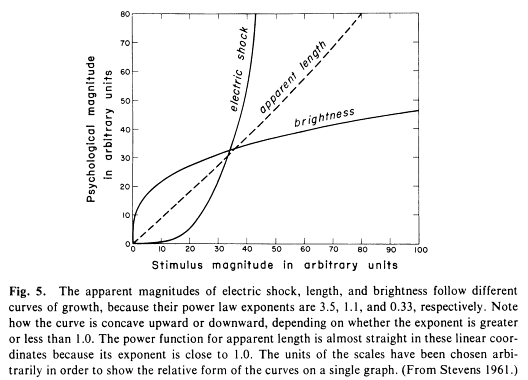 However, I've argued -- in an evolutionary psych textbook -- that there is a probably a reason why discomfort from cold and electric shock have power laws with exponents greater than perceived brightness (at low stimulus intensities), for example. It's adaptive to be highly sensitive to intense levels of things that can kill or harm you -- to avoid frostbite or death from electrocution, for example. This would also suggest that the psychophysical exponents for normally harmless dimensions such as brightness and loudness would go up for very bright lights or very loud noises (that could damage your eyes or ears, respectively). Psychologist Martie Haselton has made very similar arguments in her research on "error management theory." Roy Baumeister has made similar points in his Psychological Bulletin paper entitled something like 'Bad is stronger than good." Not the answer you're looking for? Browse other questions tagged perception sensation psychophysics or ask your own question. Do humans mentally discretize numbers? Which physical properties of a stimulus can a human attend to? How did Fechner justify the assumption that the just-noticeable-difference in sensation is constant? At what time in a psychophysical test are catch trials preferably presented? Where can I find experimental data supportive of the Hick-Hyman law?